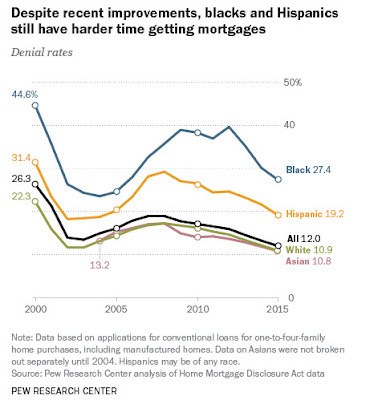 "... Black and Hispanic households today are still far less likely than white households to own their own homes (41.3% and 47%, respectively, versus 71.9% for whites), and the homeownership gap between blacks and whites has widened since 2004. An examination of mortgage-market data indicates some of the continuing challenges black and Hispanic homebuyers and would-be homebuyers face. 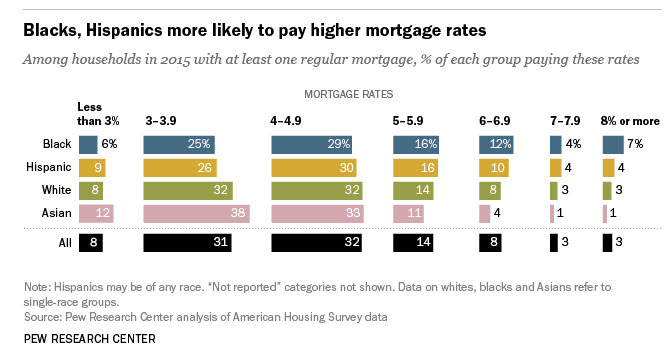 Among other things, they have a much harder time getting approved for conventional mortgages than whites and Asians, and when they are approved they tend to pay higher interest rates. In 2015, 27.4% of black applicants and 19.2% of Hispanic applicants were denied mortgages, compared with about 11% of white and Asian applicants, according to our analysis of data gathered under the federal Home Mortgage Disclosure Act. In fact, throughout the boom, bust and recovery phases of the housing cycle, blacks have been denied home loans at higher rates than most other racial groups (the exception being Native Americans, and even then only in the last few years), and Hispanics have been denied at higher rates than non-Hispanics..."